This is very impressive, as I am very technologically challenged!!! Yikes! Sorry GFC was such a bust. Especially on the alcohol front. We've always enjoyed our breakfasts there, but the service is usually suspect at best. Our waitress came right away and took our drink orders. I started with a glass of the House-made Spiced Sangria - Zolo Red Wine blended with ruby grapefruit juice and a trio of fruit $10.00. Joe had the Jungle Navigation Co. Shandy - Blue Moon Belgian White Ale mixed with lemonade $10.00. Both of these were very refreshing and hit the spot, as it was pretty steamy outside after that quick storm that blew in...By the way, our waitress was super sweet. She was attentive without being overbearing, and she gave us enough time between courses before she asked what we wanted next. And, my wine was REALLY wine!!! HAHAHA! For our appetizers, I had the Falls Family Falafel, - A secret recipe of chickpeas, garlic, onions, lemon juice and herbs with white bean dip and tomato-cucumber salad $10.00. I had this back in March and really enjoyed it, so I decided to try it again, and it didn't disappoint. 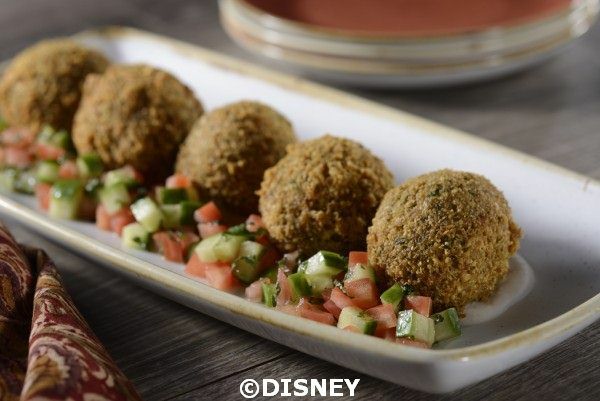 The falafel balls were crunchy on the outside and soft on the inside with an array of spices. Joe had some kind of soup that he liked too. Sorry, I have no idea what it was...But, I did manage pictures of both. For dinner, we both had the "Tastes Like Chicken" Because it is! - crispy fried chicken with citrus and ginger-scented rice, chili glaze and seasonal vegetables $24.00. I get this as my entree every time, and Joe always regrets that he didn't order it too, so he finally took the plunge. Great choice!!!! Epic fail, as I didn't get pics of our identical chicken plates... Gia had mac and cheese with fresh fruit. When they brought out her fruit, we were all delighted to see that it was shaped like Mickey!!! I've never seen this done before, and it was super cute...She liked it too. ariane37, Terra Nova guy, StarWarsMomofGirls! and 2 others like this. How wonderful that you got to get married at the Don...I tried to talk one of my 3 boys to get married their...no luck...it is so beautiful..love your ears btw...did you make them or buy them and where (incase I missed the answer..
My friend @pepperandchips made them for me. They are super comfy too!!!! Gia is a doll and is so lucky to have you and Joe as her Aunt and Uncle. I plan to bring my niece in a couple years, when she's almost 5 years old, and I can't wait! ariane37, StarWarsMomofGirls! and kastoney like this. I feel like a broken record but Gia sure takes some nice pictures, she is so photogenic! I love your Halloween shirts and your pictures at the beginning of the party. The falafel looks good and Andi and I have shared the Taste Like Chicken and really liked it! I’m excited to hear about the rest of your evening! We didn’t try any of the special Halloween treats on our party night because it was so hot and crowded! I feel like a broken record but Gia sure takes some nice pictures, she is so photogenic! Oh, Caroline...You are too sweet! We really like Skipper Canteens. We have always enjoyed some really good meals here. Terra Nova guy, StarWarsMomofGirls! and kastoney like this. ariane37, Terra Nova guy, StarWarsMomofGirls! and 1 other person like this. Terra Nova guy and kastoney like this. Terra Nova guy, buzzrelly, kastoney and 1 other person like this. After Hallowishes, we made our way to Frontierland to catch the second parade of the night. While we were waiting, Brier Rabbit noticed Gia's birthday button and had the CM's and crowd sing Happy Birthday to her (Brier Rabbit and the Country Bears were entertaining the crowd). It happened so fast, that Joe and I missed out on taking pics of the entire celebration...It was so cute and Gia LOVED it!!!!! The Boo to You Parade was AWESOME (as always)! I absolutely adore it!!! ariane37, Terra Nova guy, buzzrelly and 2 others like this. Seriously....Gia is too cute. She looks like she is having the time of her life with the princesses. Looks like you all had a great experience at Skippers. Much better than our last time. Whatever it is Joe's soup looks great. And I love the falaffel. Looks like it has a new presentation too. So good to see Gia having so much fun at the party! Loving all of her princess pictures. Looks like you guys had a blast at the party! Mike and I went on 10/18 and I thought it was super crowded. We don't think we'll go again unless they start selling less tickets, or something. This was probably my favorite dessert party. That does look really cute. We opted out of that but maybe we should have booked it to escape from the crowds for a bit.